Home » Posts tagged "Crony capitalism"
Who Exploits You More: Capitalists or Cronies? Comments Off on Who Exploits You More: Capitalists or Cronies? Via Learn Liberty, Who Exploits You More: Capitalists or Cronies? 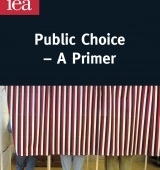 See also this short book on how political decisions come to be made: Public Choice – a Primer by Dr Eamonn Butler. Or watch Yes, Minister.